Becoming a ghost hunter is a process explained by paranormal investigation student, Mecca Hall. 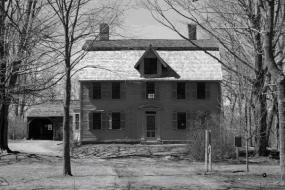 Located in Massachusetts, Mecca recently conducted her first ghost hunt at the Old Manse House in Concord, Massachusetts. She also completed paranormal classes at Bay State Paranormal. She shares her experience in training to become a ghost hunter and what a typical paranormal investigation encompasses. There is no fixed path or certification for becoming a well-trained paranormal investigator. Most students of the paranormal are left to their own research methods, and many people struggle to find effective investigation methods that work. In this interview, Mecca Hall describes her own experience of becoming a ghost hunter. LTK: Mecca, you mentioned attending your first paranormal investigation classes at the Bay State Paranormal Center. Was the class what you expected? Was there anything that you didn't expect or found surprising? MH: It's so difficult for a person who is interested in becoming an investigator to find someplace to expand and learn. Finding Bay State Paranormal Center and taking their new Ghost Hunting class was exactly what I needed to get my feet wet. I read several books, one specifically being Picture Yourself Ghost Hunting by Christopher Balzano, and I became familiar with all aspects of paranormal investigations through those books and watching shows. However, getting together with a group of people filled with beginners like myself as well as more experienced investigators allowed me to learn different aspects, such as the personal side of ghost hunting. It also allowed me to meet up with another beginner, and we've since become great friends. The classes at Bay State are kept intimate in order to allow you to get the most out of the class, but I still expected more people to sign up for it. LTK: What do you think were the most important lessons that you took away from the paranormal classes? MH: I think so many people automatically think that any occurrence at a location dubbed "haunted" is something paranormal. The class further instilled the importance of attempting to find explanations first and looking at all avenues prior to proclaiming it is potentially paranormal. I found myself seeking natural explanations at my first investigation, and I plan to go back to the site in order to attempt to recreate some of the evidence caught. LTK: Could you describe a little bit about the location and history behind your first paranormal investigation with Bay State Paranormal? 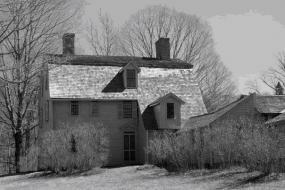 MH: The Old Manse, as named by Nathaniel Hawthorne when he resided there, was built in 1769 by Rev. William Emerson, grandfather to Ralph Waldo Emerson. Rev. Emerson was involved in the first shots of the Revolutionary War that began steps from the Manse at the North Bridge. Emerson's family is said to have watched the battle between the Minutemen and the Redcoats from the windows of the house. When Rev. Emerson headed off to Vermont to aid in the fight, he died of dysentery on his way home. His widow then began to take in boarders and met Ezra Ripley, ten years her junior. They were married two years later and lived in the house until Ezra died at the Manse in 1841. Nathaniel Hawthorne and his wife Sophia then rented the Manse for a few years. There are other speculated deaths that occurred on the property including the late term miscarriage of Sophia's first pregnancy after a fall on some ice. LTK: What was this first investigation like? Did you personally experience anything paranormal or capture any evidence like photos, evps, etc.? MH: I was extremely excited about doing my first investigation at the Manse. It was wonderful knowing many of the people attending, so everyone was comfortable. First and foremost, I wanted to get there early in the day to take pictures of the outer grounds. My friend and I spoke to a couple of Minutemen and Redcoat re-enactors as I took photographs of what I could. Once everyone else had arrived, we headed into the house to take the initial tour. Not two minutes into the tour, my friend, who was the last one in line, felt a tug on her pant loop. I focused on taking shots without the flash, but I didn't capture anything. Another sensitive experienced a feeling of dread in the Hawthorne bedroom, and it was later confirmed that Sophia had possibly had a miscarriage in that room. Due to the constant chattering of the investigators in the groups throughout the evening, my recordings were too contaminated. I've since purchased a new Sony Digital Recorder with USB port since it allows for a cleaner transfer than the other one I used for the investigation. The only EVP captured was from one of the other investigators that said, "(sigh) Mother..." in a whisper. While we sat in the attic experiencing spikes with the EMF meter, I continually heard banging on the second floor as though the other group was opening and closing doors and walking around loudly. Several minutes later, they summoned us to the first floor because they were experiencing an "encounter" in the Lady's Parlor. I asked immediately if anyone had been on the second floor and they reported being in the Lady's Parlor the entire time, never once hearing the banging we were hearing. LTK: Were there any places on the property where you felt scared or nervous? Did anyone you were with become scared or nervous at any point? MH: Many people were weary about various areas of the house. I was quite comfortable everywhere I went except during the initial tour's first climb of the main stairs. For some reason, I had a pit in my stomach at the top of the stairwell. The next time I went up, I didn't have the same feeling. Some were nervous about climbing the darkened stairwell of the attic, so I forged in front of them with my flashlight. I craved for something to happen for validation as we explored the many rooms of the house. The most nervous or scared feeling I experienced was when the medium felt there were people outside the Manse. I turned to look, and sure enough, there were people outside walking across the property. What could we do but start flashing our lights around the pitch black room for effect. They disappeared shortly afterwards. LTK: Now that you've been through paranormal training and your first investigation, what advice would you offer for people new to ghost hunting and wanting to get the most out of their first ghost hunting investigation? MH: I'd definitely suggest finding either a group or facility that teaches classes in paranormal investigation. I found taking classes and meeting people helped me become more confident in doing an investigation. The people in the classes are all there because they want to investigate just as much as you do. If there aren't classes available in your area, contact local investigative teams and ask for their input on how to become part of a group. In the meantime, read any information about investigations and techniques; practice doing investigations where you're comfortable such as your home, a friend's home or a cemetery during the day. Typically, you need permission for nighttime investigations. Visit your library since most librarians will know of a haunt or two in your area. Even if there doesn't appear to be a haunting in your home, you'd be surprised at potential EVPs you can capture. Practice analyzing evidence after your own mock investigations because this allows you to become familiar with the equipment that you have. Fine tune your ears and eyes when you're listening for EVPs or going over pictures you've taken. Another thing to look into is public investigations. Again, when you speak to local teams, ask if they plan to hold any public investigations in the future. Nightwatchers.info has a variety of public investigations at well-known haunts around the country. Of course, it costs money to attend them, but they let you see other investigators at work, and you can compare what you like and don't like about their chosen methods. I highly recommend the book from Christopher Balzano because I took away so much from it. It continues to be a reference along my path to becoming an investigator. Well, I'm off to begin investigating my parents' house where I had my first ever paranormal experience as a kid. Happy Ghost Hunting! For more interviews with other paranormal investigators from around the country, be sure to check out the Paranormal Pets and Central Maine Paranormal, as well as other LoveToKnow articles about paranormal societies, such as Pensacola Paranormal and the infamous Sci Fi Ghost Hunters.